Home NEWS Governor Ferdinand Waititu: My first 100 days in office. Governor Ferdinand Waititu: My first 100 days in office. 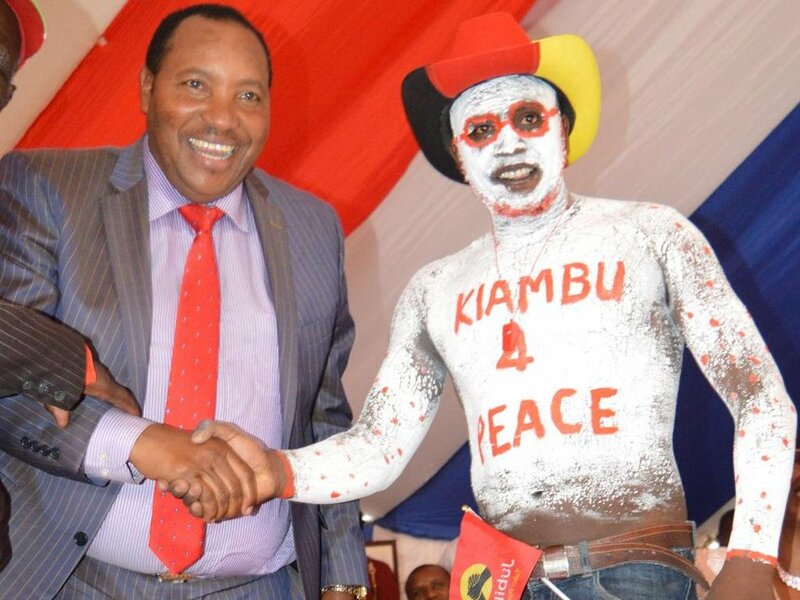 A resident of Kiambu County congratulates Kiambu Governor Ferdinand Waititu during his inauguration ceremony at Ndumberi grounds on Saturday. The first 100 days have become the traditional yardstick of a leader's early achievements in office in the recent times. In his acceptance speech as Kiambu Governor at Ndumberi Grounds, just 12 days after his momentous victory, Governor Ferdinand Waititu ‘Baba Yao’ gave one of the most important speeches — turning his campaign promises into a specific 100-day action plan. We can authoritatively refer this list of ‘game-changing’ promises as a contract between Governor Baba Yao and the Kiambu voter. Here’s what Gov. Waititu promised to achieve in the first 100 days in office. ~ Review and revise all levies, charges, licences through public participation where all licences on barbershops, salons and levies on agricultural produce including milk will be scrapped. ~ Provide a cow each to all homesteads in dairy farming regions like Githunguri. ~ Provide clean and adequate drinking water to all the residents of Kiambu County. ~ Review the county physical building act through public participation with a view of developing rules that that encourage proper development and other related construction works so as to enhance employment and wealth creation. ~ Create Ward Development Fund where all monies from will be channeled to all the wards in the county for development projects. ~ Fast-track the construction of modern markets in all the corners of the county with special emphasis on lighting, security, sanitation, water provision and modern parking through a partnership with the World Bank. ~ Start the process of buying pieces of land in every sub-county where they will set up industrial parks, the first to in Nachu in Ndeiya sub-county where the SGR is expected to pass through. ~ Embark on visibility studies and mobilisation of resources for the establishment of a modern bacon factory in Uplands. Karai, Ngoliba and Gatuanyaga to enhance food production in those areas. ~ Embark on a major clean-up campaign in the key towns and markets within the county.